Smart Green Cities: is a comprehensive overview of what global cities are doing to become sustainable. Woodrow W. Clark II and Grant Cooke have produced a book that is both practical and visionary. They have examined the infrastructure needs - sustainable development, communications, energy, water, waste, and transportation to develop guidelines, processes and best practices. City leaders are key to mitigating climate change who must plan, design and implement solutions. 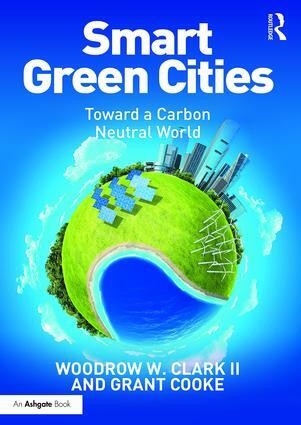 Smart Green Cities (SGC) offers a global perspective that includes implementing the Green Industrial Revolution the title of their last book. SGC discusses innovative emerging technologies, and the new economics paradigm that move beyond the out-dated neo-classical economics. The authors present examples from around the world including Europe, the U.S, China and the Middle East, which discuss the best green technologies from renewable energy power generation to smart on-site grid development. The extraordinary shift from a rural to an urban world is described; national plans are analyzed; so that future cities will be designed, built and implemented now - not 50 years from now. The struggle for the planet’s survival is being waged by the world’s cities. Clark and Cooke argue that cities are the key to mitigating climate change and reducing toxic greenhouse gas emissions. SGC introduces sustainable technologies; discusses the economics for implementing the solutions; and offers numerous examples to serve as pathways for cities to become smart, green, and thus carbon neutral. Infrastructures: energy, transportation, water, waste, and telecommunications. Personal and family needs: food and housing—example of London requiring 20 percent of new housing, public housing? What about safety, medical care, and social services? What is it and what will it do. Why it is so important to create SGCs? Main elements are: local and regional plans, integration of all systems, renewable energy, storage, smart grids, finance and funding. 9. Smart Ecocities—New Ideas for Urban Living. What makes a Smart, Green City? Dr Clark is an expert in economics, renewable energy, and sustainable communities who was a contributing scientist to the United Nations Intergovernmental Panel on Climate Change which as an organization won the Nobel Peace Prize in December 2007. In the 1990s, he was the first Manager of Energy Technology Transfer at Lawrence Livermore National Laboratory. At the turn of the 21st Century he was California Governor Davis’ Renewable Energy Advisor and then in 2004 formed Clark Strategic Partners, an international renewable energy, economics, and environmental consulting firm. Grant Cooke is a journalist and Silicon Valley businessman with experience in emerging technologies and sustainability. In 2006, he was one of the first businessmen involved with California’s $3.5 billion world-leading energy efficiency program. He is also an established writer with numerous publishing credits including The Green Industrial Revolution: Energy, Engineering and Economics�, with Clark.